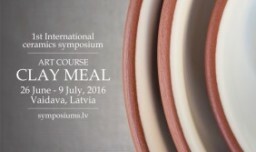 The Art Course: Clay Meal is an artist symposium related to gastronomy and art created and organized by Creativity Mecca, which is a Latvia based NGO established to support creative expression and cultural experience. This year they are having the 1st international symposium, which will have 17 artists from all around the world. The artists will work together with Chef Dzintars Kristovskis and will create serve ware and tableware for an 11-course dinner. The symposiums will end with dinner-performance in the open air on the lakeside where all the created artworks will be used.